The larger boards were primarily made from solid black walnut, but I also added in some maple accents just for a little contrast. I started out with some four quarter (1" thick) boards and some nine quarter (a little over 2" thick) boards. These were rough from the mill, so I had to do some flattening and squaring. I usually start breaking down the rough stock at the miter saw. Check out this other project to see more about that milling process. Having all of the pieces and arranging them into the 4 finished cutting boards at once saves a lot of time too. You already have your work surface occupied, so go ahead and utilize that space fully. Much of the time that you spend making things is spent setting up your tools. 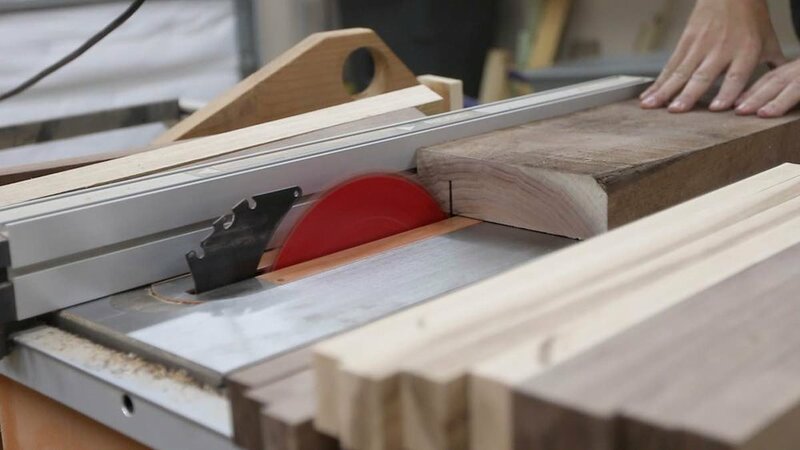 Once a particular tool is setup, like the table saw, cutting the proper width pieces, go ahead and cut all of the boards needed at once. Not only will the pieces be more accurate with each other, you will save a lot of time going back and forth between tools and setting up everything. One of the paramount things about making cutting boards well is getting really good glue lines. Some of this has to do with the amount of glue used and how you clamp the boards, but it all starts with how flat your mating surfaces are. I have tried many different ways to arrive at the same end result: flat mating surfaces so there are no gaps in the cutting boards. Many people will fully mill all of their boards before they cut the strips at the table saw. Then, they'll take them straight from the table saw and glue them together. I've never been quite happy with doing this, and I always find that they need a bit more touch-up before gluing up. Because of that, I typically get the boards flat enough for them to register properly at the table saw, but I leave the final flattening for the jointer, a tool that is built very specifically for this job. Be sure to use some push blocks at the jointer. Don't try to hold those with just your hands...these pieces are far too small at this point for that. So, how do you check to see if the surfaces are perfectly flat? One great way to check for perfectly flat mating surfaces is to take your two boards, put them together with light pressure as if they were in clamps, and hold them up to the light. Move them around a bit, and if you can't see any light through the seam, you've got a great joint! 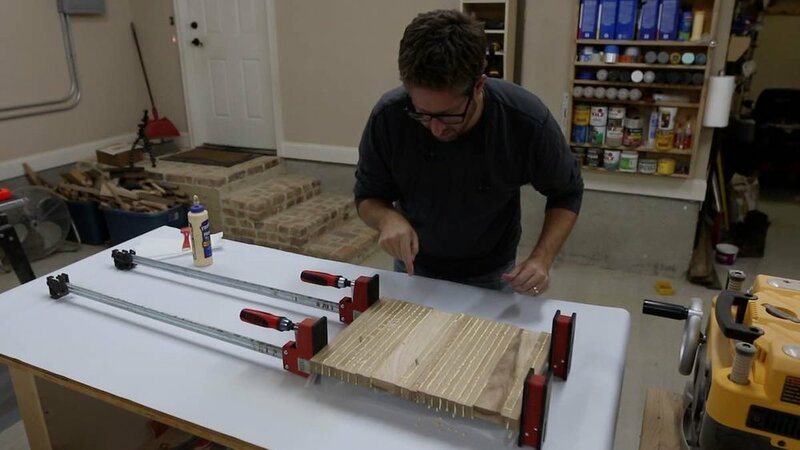 Now that you've got all of the boards perfectly flat, it is time to glue up your cutting boards. I like to use parallel clamps for this. I find that they provide the most even clamping pressure of any clamp I've used. That way, I have less of a chance of the cutting board bowing up or misaligning somehow. A way to prevent glue from getting all over your work surface is to find a large, vinyl sign like I have, and lay that under your clamps as you're gluing everything together. I'm sure you can find these around...many companies have them, and when they're done with them, they discard them. Also, if you've seen those signs around for baseball leagues, etc...when they're done with them, you can probably grab the sign. These work great, and roll up out of the way when you're done with them. Plus, you're not having to use a ton of waxed paper each time...they're reusable. If too much glue is on them, just scrape some of it off gently, and you're left with a fresh surface again. Speaking of waxed paper, I do use some strips of it to protect my clamps. Especially with these parallel clamps that I've linked, The way they work is that the ridges on the main bar provide grip for the clamp to apply pressure. If glue gets all over the bar and these grooves, your clamp will not perform nearly as well. Ask me how I know. Once you have your boards perfectly flat, it is time to glue everything together. Take each strip, and rotate it 90 degrees. That is the surface you want to add glue to. Add a generous amount of glue to each strip. You can use a number of things to spread the glue out: your finger, a cheap spatula (like you see me using), an actual glue brush that some companies sell or even just a cheap silicone basting brush will work. Be sure the glue is evenly spread on each of the surfaces, rotate the pieces back 90 degrees, and put them together. Look at your boards after you've glued them up. So you see glue squeezing out between each of the individual boards? If so, you've done it right. Many times, you will not see a continuous line of glue between each of them, but rather some kind of dots where the glue is coming out all along each seam. Great job! You've done it! Many cutting boards will come into contact with water and moisture at some point in their lives. As soon as water is put onto a board that previously felt very smooth, it is suddenly not smooth to the touch any longer. This is because the fibers of the wood actually react with the moisture and kind of stand up. I used a quirt bottle with some water in it to mist the boards, wiping off any excess with a paper towel. I let them dry and then do a final sanding with 220 grit sandpaper. Now, when the client gets the board wet at all, it will still feel as smooth as the day I gave it to them. 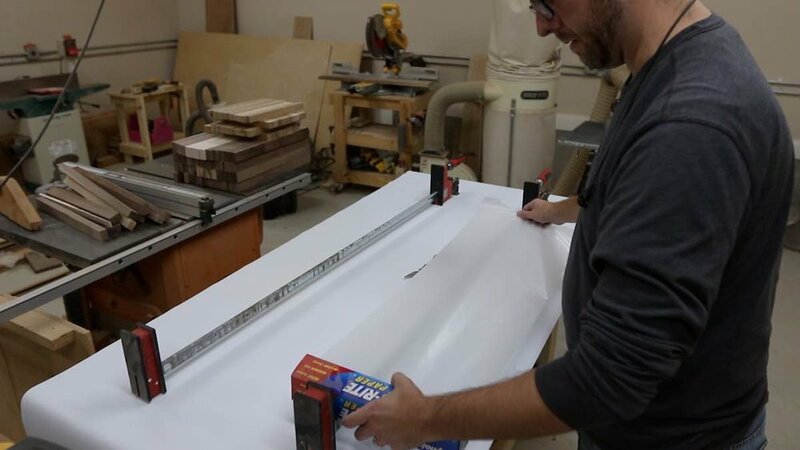 I'm not going to go into that here in this blog post, but I will probably do an entire post in the future about my cutting board finishing process. I like to add non-stick feet to the larger cutting boards that I make. This does limit how you use the board, since that pretty much eliminates one side, but I just think it looks nicer. Plus, many people that purchase these large ones keep them out on the counter as part of their kitchen decor. They don't want this particular one to have to put away each time they use it. I don't typically add feet to the smaller ones, since they're the type of board that gets pulled out, used quickly, and put away. This also allows both sides of this small board to be utilized. The feet I use are in my materials list above. They are Everbilt from Home Depot, and they're my favorite. They are white, and rubber, and very high quality. To add the feet, I use a combination square and measure out a set distance from two of the the sides. I mark that spot, and drill out a tiny bit of the material, making room for the screw so the wood won't split. Then, I just add the screw to hold the rubber foot on, and the cutting boards are done! Be sure to watch my video of how I made these. You might catch some things in there that I didn't include here.